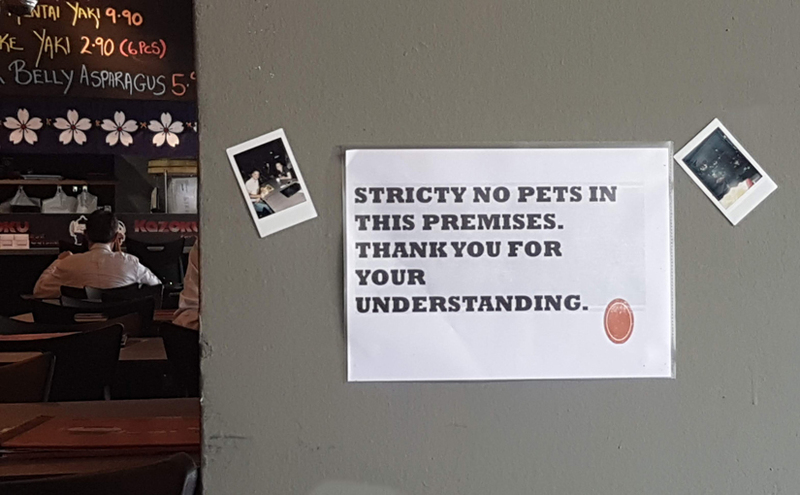 I’m not sure what the distorted red circle adds to the message, but in any case, “premises” is plural, so the sign should say “these premises” and not “this premises”. Furthermore, “strictly” is missing its L.
More on this error below. Maybe the person who wrote the signs was thinking “these” premises but wrote “this” because in Singapore, short “i” sounds like long “ee”. More likely, the problem is that “premises” clearly indicates one place, so logically it would seem to be singular, letter “s” notwithstanding—but no, “premises” is actually plural. Wikipedia claims the usage of “premises” to refer to a piece of property arose because owners saw the word “premises” embedded in the legalese in the title deed for their property and drew a more literal connection than was actually implied. My guess is that legal documents used “premises” to refer to previously mentioned boundaries or other relevant details that were always plural, thus the singular word “premise” was never thought to indicate a place, and cannot now be used to indicate a place. The word “premise” literally means “sent before”. In this sense, “premise” means a statement that forms the basis of a logical argument, because the premises would be laid out before the conclusion. Next Next post: Public talk 7 August 2018: Does your language control you?